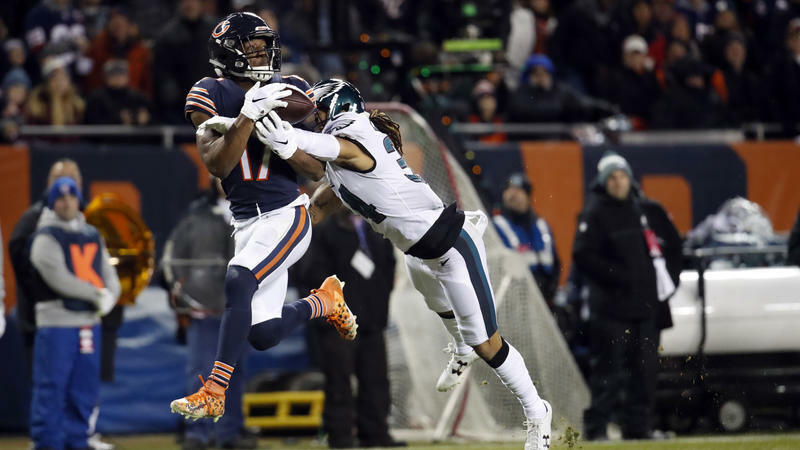 (Brian Cassella / Chicago Tribune) Chicago Bears wide receiver Anthony Miller (17) has a pass broken up by Philadelphia Eagles cornerback Cre'von LeBlanc (34) after a review in the second quarter on Jan. 6, 2019 in an NFC Wild Card playoff game at Soldier Field. Dhruv Koul shares his in-game reactions, thoughts and observations on the Eagles-Bears Wild Card playoff game at Soldier Field. Follow him on Twitter @DhruvKoul to continue the conversation. If you’ve been living under a rock this season, the Chicago Bears completed a magical worst-to-first turnaround in 2018, going 12-4 in Matt Nagy’s first year as head coach en route to the NFC North title and the third seed in the playoffs. These results gave the Bears the right to host a playoff game in the Wild Card round at Soldier Field — the Bears’ first playoff game in eight years. 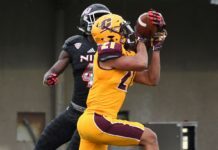 Interestingly, Chicago had the opportunity to host the divisional rival Minnesota Vikings for the second straight week if they’d lost against them last week in a game that meant nothing to them. But Matt Nagy and the Bears decided to step on Minnesota’s collective throats, dominating them at U.S. Bank Stadium to end their season and set up a date with the Philadelphia Eagles. That date was today. The storylines for this matchup were juicy: Matt Nagy and Doug Pederson, who are extremely close friends and former colleagues under Andy Reid’s tutelage, matching wits on the offensive side of the ball. Mitch Trubisky’s playoff debut. Big Game Nick Foles getting an opportunity to start another playoff run in place of Carson Wentz again. Alshon Jeffery returning to Soldier Field to take on his former team. One thing was for sure, today’s game was going to be a fun and exciting one. That and the fact that two of the biggest NFL markets were involved is likely why this game drew the biggest ratings’ time slot on NBC. No prediction from me this week — Playoff Twitter annoying as hell with its "aNd ThEn WhAt HaPpEnEd?" pestering. 1. I see Foles getting the ball out quickly vs. pass rush. Bears need to tackle. In the end, Cody Parkey’s doink resulted in a Bears’ loss. Just heartbreaking. 1. It’s interesting how much the national media and even some fans questioned the Bears’ decision to continue playing their starters and go for the win last week when it was clear the Rams were going to crush the 49ers. 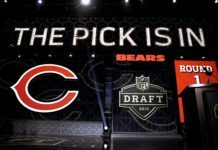 With no hope of a first round bye and the Bears’ dominance over the Vikings clear, people wanted the Bears to lose to secure that matchup again the next week. Instead, the Bears won and so did Philly in Washington, clinching the Eagles’ Wild Card berth. Philadelphia, IMO, is indeed a more dangerous team than the Vikings. But in order to win the Super Bowl, you have to beat the best teams in the playoffs. And I’d rather the Bears go in to the postseason in rhythm as far as mental preparation and “killer instinct” goes. They displayed it last Sunday and it’ll help them immensely in gearing up for today’s game. 2. I’m really excited for Mitch Trubisky’s game today. The Eagles will likely game plan like they always do — gear up to stop the run and make Trubisky beat them early on in his playoff debut. The Eagles have a tough, fast defense; and though their secondary has holes, their pass rush is fierce. Trubisky will have to make plays to beat the Eagles, and he’s played extremely well the last three weeks in some big games, including two on the road. Let’s see if he can keep it up. 3. Eddie Jackson will play today after being on the injury report the last three weeks, but Trey Burton, who was a surprise addition to the injury report last night with a groin injury, will not play today. While Jackson being good to go helps a lot in the secondary, losing Burton is big for Trubisky. 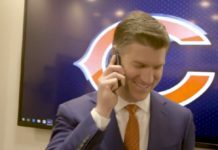 Burton has been a security blanket for the Bears all season, and he was likely who the Bears expected to find holes in the Eagles’ secondary. Though this becomes a big opportunity for second-year TE Adam Shaheen. He’s made some big plays this year sprinkled in between games, so let’s hope he can exploit some matchups in Burton’s stead. 4. Bears won the toss and deferred, and on the Eagles’ first drive, they looked comfortable going down the field and towards the red zone. Nick Foles got the ball out early (as I thought he would) and found comfortable holes in the Bears’ zone coverage. Leonard Floyd did sack Foles on the ultimate third down to force a field goal, which Jake Elliott hit: 3-0 Eagles. Good job by the defense to not break, but the march between the 20s was a little unsettling. On the Bears’ first offensive drive, it was a bunch of weird stuff. The Bears got two first downs thanks to two third down throws by Trubisky. 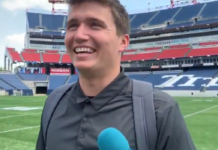 But he NARROWLY avoided a pick-six on the third third-down, resulting in a punt. Keep in mind, the Eagles are the playoff battle tested team and the Bears are young and largely new to this, so some nerves are expected. Let’s hope they settle down. The Bears are fortunate to not be 10-0 early thanks to that missed pick-six. Needs to be cleaned up. 5. After a couple of strange possessions, the Bears stopped another promising Eagles’ drive thanks to a fantastic interception by Roquan Smith. He broke on the ball and stole it from the receiver, this after the Eagles converted three big first downs, two coming on big passes to Alshon Jeffery. After that INT, the Bears appeared to go 3-and-out, but a Michael Bennett unnecessary roughness call gave the Bears new life. The Bears got into field goal range and made it to tie the game at 3. But Trubisky came up limping after a third down scramble and went into the medical tent. Needless to say, Chicago is holding their breath right now. 6. Trubisky came back on the next drive and it was clear whatever injury he had is hurting him. On a second and long, he targeted Allen Robinson on an out route that seemed to have little juice. Eagles’ CB Avante Maddox broke on the ball brilliantly and almost picked it, but bobbled it OOB, giving the Bears new life. Trubisky the had a good matchup with Robinson outside and had him deep, but led him OOB with the deep throw, leading to a punt. The Eagles are also tackling very well on defense, fitting their run gaps well, and flying to the football. They are a good defense. And if Trubisky is hampered by his injury, Matt Nagy is going to have to be a magician today. 7. What the actual hell happened on the final drive of the first half? Trubisky was a mixed bag on that drive, mixing in a couple nice throws (and one brilliant one) with one poor one and one AWFUL decision that should’ve been picked in the end zone. But on that drive, Trubisky launched deep to Anthony Miller that seemed to be caught and came out at the last second before going down. They ruled it incomplete on the field. After reviewing it on the NBC camera angles, it looked like a clear-cut catch and fumble, but nobody recovered the ball — the ref ended up picking it up. Because there was no clear recovery, everyone’s understanding was that that should be Bears’ ball near the goal line. But the review came back staying with the call on the field of incomplete. Crazy. Apparently, it’s the “rule” officially, but it’s a BAD rule. That was a catch. This is horseshit. Soon after that play, the Bears survived a dropped pick in the end zone to close the half with a field goal to take a 6-3 lead at the break. What a crazy, weird half. But Trubisky has been quite awful today, getting away with three throws that should’ve been intercepted. He HAS to play better. Bears get the ball first after halftime. 8. The Bears are getting thoroughly outcoached right now. It’s clear who the experienced, comfortable team is. The Bears have been unable to do anything with their normal offense and with the Eagles spying Trubisky with Nigel Bradham, he’s been unable to make plays with his feet. And then on defense on the ensuing possession, the Eagles got plenty of help by Bears’ penalties. A defenseless receiver flag on Zach Ertz against Adrian Amos kept a drive alive, and then Prince Amukamara interfered on a gorgeous Foles deep ball near the goal line. Foles then found Dallas Goeddert and all of a sudden, Eagles are up 10-6. Soldier Field is silent and the pressure is on. 9. Bears promptly go three and out. The referees didn’t call an obvious hold on the Eagles’ CB against Taylor Gabriel, and then Adam Shaheen got tackled by Cre’Von LeBlanc on a critical third down. Not a good response. The defense is likely gassed at this point and the offense is not pulling their weight. 10. A nice ensuing drive for the Bears ended with just a field goal. After a quick throw for a first down, Trubisky hit Robinson for a big 45 yard gain on a beautifully executed ‘sluggo’ route. On the next play, they should’ve connected on another big play near the goal line, but Robinson just missed getting his foot down. Still, Eagles up 10-9 with 14 minutes left in the game. I frankly would’ve preferred the Bears go for it on fourth down there with that field position and being down four points, but I suppose it’s early enough where cutting it down to within a FG is acceptable. Tough to swallow, but some points are better than none. 11. Wow! The Bears went right down the field on the next drive — Trubisky hit some beautiful throws in clutch moments on that drive. He converted a big third and long to Taylor Gabriel while getting drilled by Fletcher Cox, then a big throw to Josh Bellamy and and then a touchdown big throw to Allen Robinson to take a 15-10 lead! That was poise and brilliance from Trubisky. 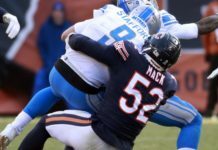 The Bears went for two and made it fun — Khalil Mack was out on the field for that play! The Bears didn’t score but it was still fun. Going for two to go up seven was more valuable than trying an XP to go up six. As it is, Bears up five with nine minutes left. 12. After an awful punt from Pat O’Donnell, the Bears’ defense forgot how to tackle. The Eagles came up with some cool, creative plays, but the Bears had plenty of chances to tackle Eagles’ runners/receivers early and failed, allowing a ton of yards after contact. That allowed Philly to get down to the Bears’ 13 with two minutes left. It was too easy. 13. First and goal at the two for the Eagles and the Bears didn’t use their timeouts until after the second down. They wasted a LOT of time there. John Fox did this in Detroit a few years ago in one of the wildest coaching decisions of his tenure. The Bears needed that time, because on fourth down, of all downs, Foles found Golden Tate for a touchdown just inside the goal line on Sherrick McManis. Brutal. Week 1: Packers took 24-23 lead. Trubisky had a chance to win it and came up woefully short. Wild Card game: Eagles take 16-15 lead. 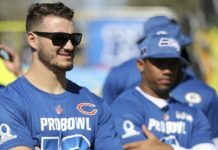 Trubisky has a chance to win it. Why do these things come full circle? All-Pro return man Tarik Cohen got things started well with a kickoff return to the Bears’ 42. 14. TRUBISKY WITH A BIG TIME THROW TO GET INTO FIELD GOAL RANGE! 15. Cody Parkey doink. No words. 16. Some perspective on this season, and anticipation for the next, I guess. 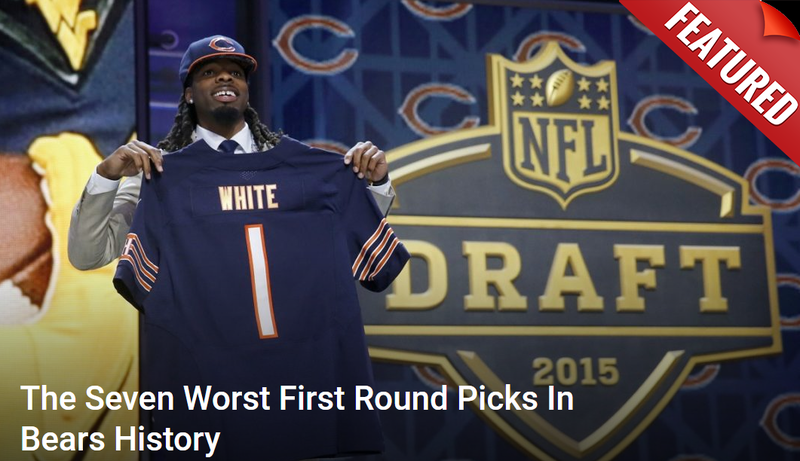 Even if the Bears lose, remember to appreciate how far they've come and how great this season was. And they haven't come close to peaking yet on offense. Just imagine.